Turn a plain mirror into a fun bedroom accessory. Polka dots and flowers are pretty, but you can combine any two patterns you like. Every bedroom needs at least one full-length mirror so you can check out your outfit from head to toe before heading into your busy day. If you've been making do with the bathroom mirror or a small wall mirror over the dresser, you're cheating yourself. Not only that, but mirrors add light and a feeling of spaciousness to your room, making a full-length mirror the perfect way to visually enlarge a small bedroom. Though mirrored closet doors are wonderful for getting the big picture, not every bedroom has the space or the right sort of closet doors for such mirrors. In these cases, your best bet is an over-the-door mirror, such as the one pictured here. The only problem is that the typical inexpensive over-the-door full-length mirror is rather boring. It’s a simple task to transform a plain mirror into a decorative accent for your bedroom. What girl wouldn’t enjoy primping in front of this pretty mirror? Or if decorating a mirror for a boy’s room, imagine it framed in camouflage, geometrics, comic-book characters or a shiny metallic. And a decorated mirror isn't limited to a child's bedroom; you can just as easily cover the frame with gold or silver, a trendy animal print, a sedate stripe or your favorite bright color. With the wide range of decorative duct tape available, you’re sure to find designs you love. In an hour or two, you can transform a boring, plain white-framed mirror into something special! 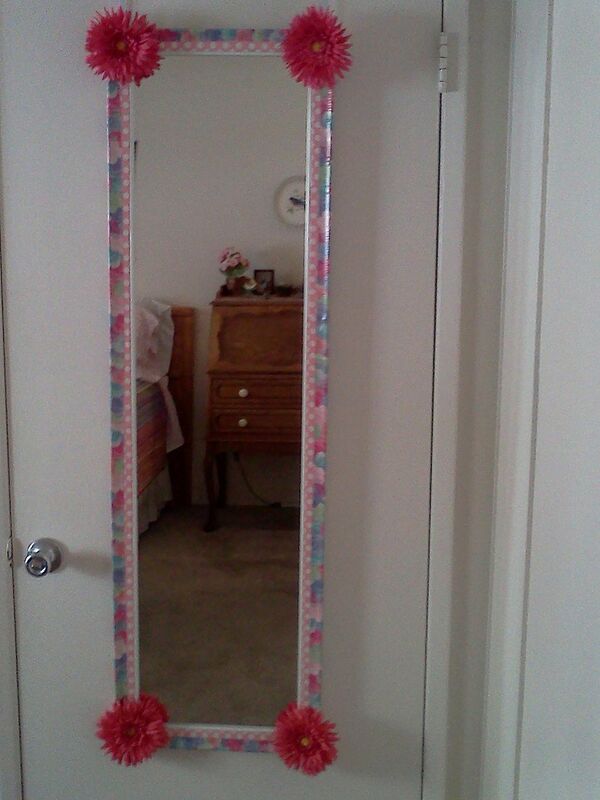 Choose two rolls of duct tape that suit the user of the mirror. The colors and patterns are up to you, but make sure there is enough contrast between the two rolls of tape to clearly show in the finished project. Decide which tape you want on the inside rim of the mirror’s frame and which on the outer rim. I chose pink-and-white polka dots for the inside and floral print for the outside. Cut a strip of inside-rim tape around six inches long. Starting at the upper left corner of the mirror, carefully align your strip of tape with the inner rim of the frame. Use your fingers to smooth the tape into place, easing away any bubbles or crinkles. Fold the tape over the edge of the frame, and smooth it into place. If necessary, reposition your tape so it lines up evenly with the mirror’s frame. Continue to cut and place strips of tape, overlapping at the corners. Cut a strip of your outer-rim tape. Starting at the upper left-hand corner, line the strip of tape up with the outer rim of the mirror frame. Press the tape into place, folding it over the frame’s edge to overlap the inner-rim tape. Continue to cut and place strips of tape until the mirror’s frame is complete. I added bright, faux flowers to my mirror for an extra touch of feminine fun. You can do the same, or add any lightweight extra to the corners of the mirror. If using flowers, cut the stems off completely to make the flower as flat as possible. If using another accent, make sure the bottom is flat enough to attach to the mirror. Press an adhesive mounting square onto the back of each flower or another accent piece. Attach your accents to each corner of the mirror. If your accents don’t stick easily, use additional mounting squares underneath to hold the piece in place. Mount your mirror on the back of the bedroom door and enjoy!